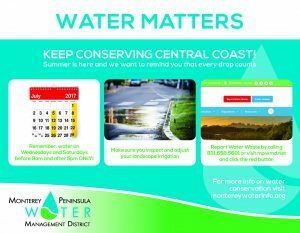 While the Monterey Peninsula saw a significant amount of rain during the winter, water conservation during the summer is still an important factor in our region’s water supply status. 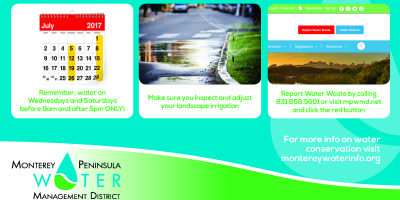 As the temperature rises, residential and commercial water use naturally rises for a variety of reasons. On the residential side, kids are home from school, gardens and landscaping need additional water and naturally. more showers are required! On the commercial side, construction has picked up and of course more visitors are frequenting our beautiful area. Although Governor Brown has lifted the statewide drought emergency regulation, our area still must meet conservation goals as part of the State Water Resources Control Boards Cease and Desist Order. That does not mean use no water, just be mindful of not wasting water. Here are three ways to help!